This Mongolia stir-fry restaurant offers a full bar, so you can enjoy an adult beverage while watching the fantastic, fiery performance of the chefs working at the enormous grill. Build your own meal with an extensive array of sauces and a ridiculously diverse array of meats and veggies. The ingredients vary from day to day, but the most extensive menu options are always at night. Custom build your own stir fry and watch it grilled up right in front of you. There's one flat rate and unlimited refills on your bowls of mixed and matched sauces, spices, and a ridiculously diverse array of meats and veggies. The ingredients vary from day to day, but the most extensive menu options are always at night. 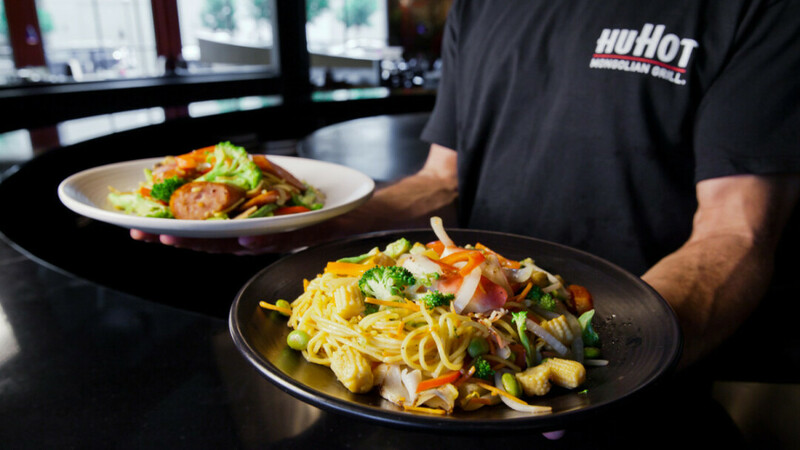 Besides being extremely vegetarian friendly and offering gluten-free options, HuHot is more than willing to clean and accommodate to any allergies you may have as well. Party room suitable for about a dozen people. Free birthday dessert.